As the cost of tickets, parking, and concessions skyrockets, while home theater technology becomes more affordable, fans wonder: Why even bother going to the game? Here’s how progressive sports owners and Building Teams are packing stadium seats. The six-story “patio doors” at the Sacramento Kings’ Golden 1 Center will draw in fresh air and let outdoor visitors listen to concerts. Photo: Courtesy AECOM/Sacramento Kings. Click here for larger view. Brooklyn, N.Y.’s Barclays Center was designed to host a wide range of events, from concerts and boxing matches to the circus and Brooklyn Nets basketball games. The arena, which opened in 2012, can accommodate hockey, but it doesn’t do it very well. The NHL’s New York Islanders moved from the decrepit Nassau Coliseum to Barclays for the 2015-16 season. While the players enjoy the spacious dressing rooms, swank lounges, and sophisticated training facilities, fans can sense that hockey is an afterthought. Around 400 seats in the building have obstructed views, and more have what are considered limited views. Fans that paid good money can’t see all the action. That’s a big problem—or is it? In February, Nets and Barclays Center CEO Brett Yormark spoke with Sports Illustrated about the seats. Yormark defended the arena, saying that the majority of the seats offered great views, and that fans know of the obstructions before purchasing tickets. Fans, Yormark points out, don’t necessarily need to see live action to enjoy a game. They can follow along on their phone, aided by the arena’s WiFi signal. They can watch the game on the massive video boards, and keep tabs on the action while dining at the arena’s restaurants or shopping at its stores. It takes more than unobstructed views to draw fans to games. The rise of mobile devices and increasingly affordable home theater technology—especially HD and Ultra HD televisions—means that, for many fans, the best seat in the house is at home. Factor in the escalating costs for tickets, parking, and concessions, and there’s little wonder why attendance across the four major U.S. sports has plateaued. BD+C spoke with leading sports facilities firms to learn how progressive franchises are attempting to counteract this trend. They offered four primary trends. Levi’s Stadium in Santa Clara, Calif., was designed to provide both top-notch mobile Internet coverage and views of the surrounding hills of Silicon Valley. Photo: NHTB/Jim Simmons. Click image to enlarge. Unlike the Barclays Center, Levi’s Stadium, the San Francisco 49ers’ new stadium in Santa Clara, Calif., doesn’t have obstructed views. The sports architecture team from HNTB designed Levi’s so that two-thirds of the stadium’s seats—some 45,000 of the 68,500—are in the lower bowl, allowing fans to sit as close to the field as possible. Good seats alone aren’t enough in today’s sports climate. Fans are wired. They rely on their phones and tablets throughout the game to watch video clips, share photos on social media, monitor other games, check their fantasy league scores, and kill time in between game action. To do all of this, they need the strongest wireless signal possible. Levi’s, which opened in 2014, has 70 miles of cable installed for WiFi, with 1,200 total access points and 1,200 Bluetooth beacons. It is the world’s first sports venue to offer 40 gigabits/second data speed. It can handle 80,000 fans using WiFi all at once—a claim that was put to the test during Super Bowl 50 in February. Fans who attended used 10.1 terabytes of data on the stadium’s WiFi network, surpassing the Super Bowl’s previous record of 6.2 TB, from last year’s game in Glendale, Ariz. The stadium even has its own app, which offers fans a host of features and amenities: enhanced replays from multiple camera angles, real-time stats, food orders and delivery, even directions around the stadium. The technology works both ways. The Levi’s Stadium app enables the team to track user behavior with real-time data—from who’s ordering what and where, to how frequently replays are being watched. The app is a revenue source as well, generating some $2 million during the 2014-15 season through food and merchandise orders and rotating corporate sponsorships. The Minnesota Vikings are installing WiFi hotspots inside the handrails at its new U.S. Bank Stadium. The MLB’s Atlanta Braves partnered with Comcast to provide high-speed Internet—including two data centers, each with 10,000 fiber connections with dual 400-megawatt generators—throughout its 60-acre development that includes the new SunTrust Park. And the NBA’s Golden State Warriors, which has a new arena planned for 2018, are testing Apple iBeacons at their current home, Oracle Arena. The Sacramento Kings' new Golden 1 Center will have an 84-foot long 4K Ultra HD video board. Photo: Courtesy AECOM/Sacramento Kings. Click image to enlarge. The Sacramento Kings’ new Golden 1 Center, set to open later this year, will feature the league’s first 4K Ultra HD video board. It has a horizontal resolution of 4,000 pixels, four times the number of pixels on a standard HD 1080p display. The 6,100-sf, center-hung scoreboard is comprised of four screens, the largest of which will extend 84 feet, nearly the entire length of the court. Between the video boards, a robust wireless network, and experimental technologies like motion capture and player tracking, the Kings are thinking ahead (and other NBA teams are following suit). “It sounds amazing today, but in five years this building will be able to handle everything that is going to be thrown at it that hasn’t even been thought of yet,” says Jon Niemuth, AIA, NCARB, LEED, AECOM’s Director of Sports in the Americas, the project’s design architect. Mercedes-Benz Stadium, the Atlanta Falcons’ new home in 2017, has a retractable roof unlike any other venue seen since the Roman Pantheon, after which it was modeled. Eight roof petals close like a camera shutter, covering an open-air oculus in the ceiling. Around that opening is prime real estate. Design architect HOK created a 360-degree HD LED video board that will be built into the roof structure. At five stories in height and 63,800 sf in area, the board will be the largest in the NFL. The halo video board at Mercedes-Benz Stadium in Atlanta will bombard Falcons fans with a wide range of information, from innovative replay angles to detailed stats. Photo: Courtesy HOK. Click image to enlarge. In addition to video, the board will display graphics, stats, animations, and, of course, ads and sponsor messages. The halo layout allows fans to view the live action and replays from multiple perspectives. Another idea: During punts, the board will display a fixed view of the field. The background will be static, and the game action will move across the board. The soccer-specific LAFC Stadium in Los Angeles will have seats that encroach the edge of the field and seating with steep rakes to create “visual walls” of fans. Photo: Courtesy Gensler/LAFC. Click image to enlarge. 3. TEAMS ARE TAKING ‘ON TOP OF THE ACTION’ TO A WHOLE NEW LEVEL. Part of the charm of older sports facilities, such as the Warriors’ Oracle Arena in Oakland, is their intimate yet raucous setting. Fans are on top of the action, and can affect the game with crowd noise. It’s not uncommon for noise levels to surpass 120 decibels (comparable to that of a jet engine) at Oracle. The design team for the Warriors’ new 18,000-seat multi-purpose Chase Center, set to open in San Francisco’s Mission Bay neighborhood in 2019, is attempting to replicate the Oracle’s intimacy and acoustics. The design team shrunk the volume of the lower bowl, opted for only one ring of luxury suites, and, since the venue will not accommodate hockey, shortened the long axis of the arena (hockey rinks, at 200 feet, are more than twice the length of basketball courts), “pulling the basketball fans closer to the court,” says David Manica, AIA, NCARB, LEED AP, President of Manica Architecture, the lead architect on the project. Fans of all sports want to be as close to the playing surface as possible, but it might be most important in soccer. The sport is catching on in the U.S.—Major League Soccer has gone from 10 teams in 2004 to 20 in 2016, with four more clubs expected to begin play in 2017 and 2018—and soccer-specific stadiums are in vogue. Previously, many MLS clubs played in NFL, CFL, or college football stadiums, which weren’t ideal. MLS clubs drew 21,000 fans per game in 2015; football stadiums can hold upwards of 80,000 seats. “Soccer is a game that thrives on being in an intimate sort of venue, a loud venue that provides a really strong connection between the players and the fans,” says Jonathan Emmett, Principal and Sports Practice Area Leader with Gensler. In designing a new stadium for the Los Angeles Football Club, a 2018 MLS expansion team, Emmett’s team drew inspiration from European-style soccer venues, which place fans at grass level, eight to 10 feet from the playing field. The design team also studied Liverpool’s Spion Kop, a steep single-tier section of seats behind one of the goals, at the English team’s home at Anfield. The LAFC Stadium will have first-row seats at field level, 12 feet off the pitch. A roof canopy will shade fans and reverberate crowd noise. And, much like the Kop, seats will be at a very steep rake. LAFC Stadium will bring 140,000 sf of improved open public space to its site at Exposition Park, which also contains museums, science centers, and the Los Angeles Coliseum. The club estimates that its home will generate $129 million in annual economic activity and $2.5 million in annual tax revenue. Photo: Courtesy Gensler/LAFC. Click image to enlarge. Along with building the teched-out Golden 1 Center, the Sacramento Kings are revamping the former shopping mall that sits to the north of the new arena. Downtown Plaza, which opened in 1971, will become Downtown Commons, or DOCO. The three-acre plaza will have public space for fresh markets and outdoor activities, like yoga and ice skating, in addition to a barbecue restaurant, a chain eatery with a bowling alley, an American-style pub, and a boutique hotel. All together, DOCO will have 1.5 million sf of mixed-use space, with 300,000 sf for retail. The development is expected to generate $11.5 billion in economic activity for the Sacramento region over the expected 35-year lifespan of the arena, according to a third-party analysis conducted in 2014. 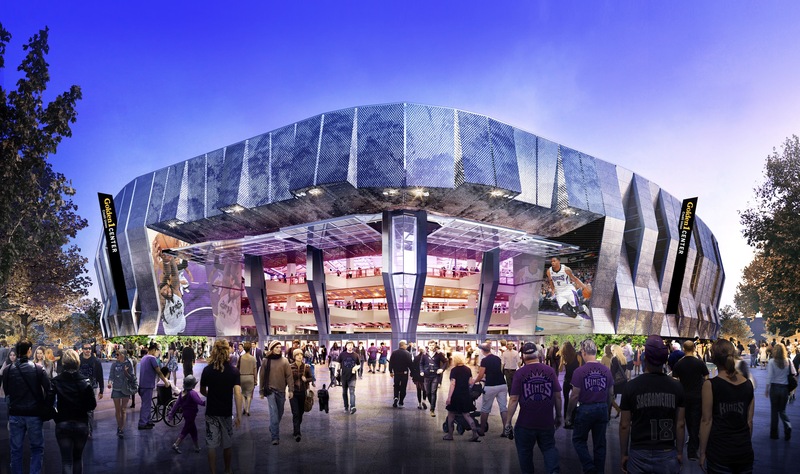 The arena will draw some 1.6 million new visitors downtown each year, generating approximately $8.5 million in additional sales tax, according to the Kings. The ultimate goal is to create a destination that will entice fans to come early, shop and eat, watch the Kings, and then stay late to shop and eat some more. Niemuth says that the Golden 1 Center is also attempting to be the “world’s best amphitheater.” A six-story glass hangar door on the far end of the arena will open to the rest of the development. During concerts, 19,000 fans can pack the arena, and an additional 20,000-30,000 people can listen outdoors. The Warriors’ Chase Center will sit on an 11-acre site near the Bay that will feature 100,000 sf of retail space and 3.2 acres of plazas and public space. Plans also call for a 5.5-acre waterfront park with lawn areas. Manica’s firm consulted with the Mission Bay community during the design process. He says the neighbors were more excited about the commercial aspects of the project than the arena itself. The Warriors' Chase Center. Photo: MANICA Architecture/steelblue llc. Click image to enlarge. The Cubs’ Wrigley Field has long been a fixture in its Chicago neighborhood (so much so that it’s called Wrigleyville), and the ballpark lures visitors to its nearby bars, restaurants, and shops. Part of the team’s ongoing, multiyear redevelopment project, dubbed the 1060 Project, is to provide on-site retail and dining options for fans. The goal: make the ballpark a year-round destination. “What we’re doing here,” says Julian Green, the Cubs’ VP of Communications and Community Affairs, “whether it’s increasing the points of sales for concessions, upgrading our suites, or providing more amenities for the fans, means that we’re hoping that more of our fans will be able to spend more money right inside the ballpark. That money goes right into the team.” The more money the Cubs earn, the more it can spend on player salaries and other on-field resources. The 1060 Project includes the construction of a two-story retail and entertainment area in the right-field corner of the ballpark, as well as an office building with retail shops, and a boutique Starwood hotel adjacent to Wrigley. An open-air plaza will hold an ice rink in the winter and a farmer’s market in the summer. The $575 million development is expected to be completed by 2019. The Milwaukee Bucks’ new 714,000-sf, 17,000-seat arena, currently being designed by Populous and Eppstein Uhen Architects, will be a centerpiece of a development that is intended to serve as a “community living room for Milwaukee,” with a mix of spaces for living, working, and playing, says Brad Clark, Senior Principal with Populous. About half of the estimated $1 billion total project cost is allocated for a new mixed­-use development, with a public plaza that will feature restaurants, bars, and other entertainment-based uses. The entire 30-acre district will be built over 10 years, and could eventually incorporate housing, offices, and hotels. Factoring in frigid winters, the Milwaukee Bucks’ arena master plan depicts a translucent canopy structure over the outdoor plaza. The Bucks’ 17,000-seat arena will be the hub of a 30-acre district that could eventually contain space for living (housing), working (offices), and playing (sports events and concerts). Photo: Courtesy Populous. Click image to enlarge.